The first few weeks after the birth of a child can be extremely physically and mentally taxing on a new mother. Lack of sleep and self-care can lead to postpartum repression and even, in some extreme cases, postpartum psychosis. Often considered to be a form of bipolar disorder, postpartum psychosis affects only one or two out of every thousand new mothers, but its symptoms are serious. 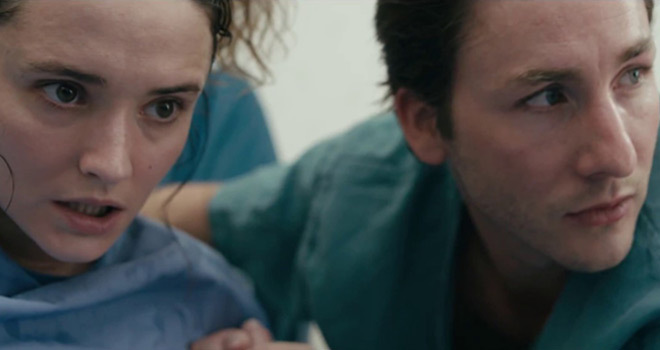 It would seem that the extreme mood swings, paranoia and hallucinations that are characteristic of postpartum psychosis would make for a clever, engaging premise for a horror film, though a potentially very tricky and volatile one if not handled correctly. Still/Born swings for the fences but ultimately leaves the viewer feeling more uncomfortable than scared. Young parents Mary (Christie Burke, Breaking Dawn Pt. 2) and Jack (Jesse Moss, Final Destination 3) lost one of their twin sons to stillbirth. Though their son Adam is healthy, the trauma of such an experience has a profound effect on the couple, particularly Mary. Mary begins hearing demonic voices and seeing unexplainable phenomena, believing a curse is on her surviving child. But can she be sure that what she's experiencing isn't all in her head? Still/Born has a lot of interesting ideas but never seems quite sure how to manifest them. Unfortunately, the choices it does make are sloppy and often ill-advised. Mental illness is a tricky subject to begin with; as a horror film trope, it requires a skillful touch to be impactful without being exploitative. Still/Born only wishes it was capable of such nuance. It's not confident enough in its own scares to be a convincing paranormal story, which makes the postpartum psychosis stuff come off as uncomfortable. The acting, particularly the lead couple, is serviceable with what they're given, but the occasional awkwardness of the material often leaves the actors holding the bag. Still/Born is a difficult film to watch, mainly because it's not sure if it wants to be a paranormal or mental illness horror, so it seems to settle for being a clumsy mash-up of the two. The ick factor of Still/Born is uncomfortably high, though not for the usual gory reasons. Technically it's a good-looking, well-constructed film with impressive acting and effects for indie horror. Still/Born lacks confidence in its tropes, and its uncertainly in its own identity results in a film that gives viewers the willies for all the wrong reasons. Perhaps a female creative voice could have provided a fresher, more interesting perspective; alas, Still/Born struggles with the nuances of its difficult subject matter and comes off only as exploitative. Still/Born is ambitious but deeply flawed and confused horror that will leave a bad taste in the viewer's mouth.